This afternoon I had the privilege of witnessing my grandfather, Bryan Thomas, receive a Quilt of Valor for his service in World War II. 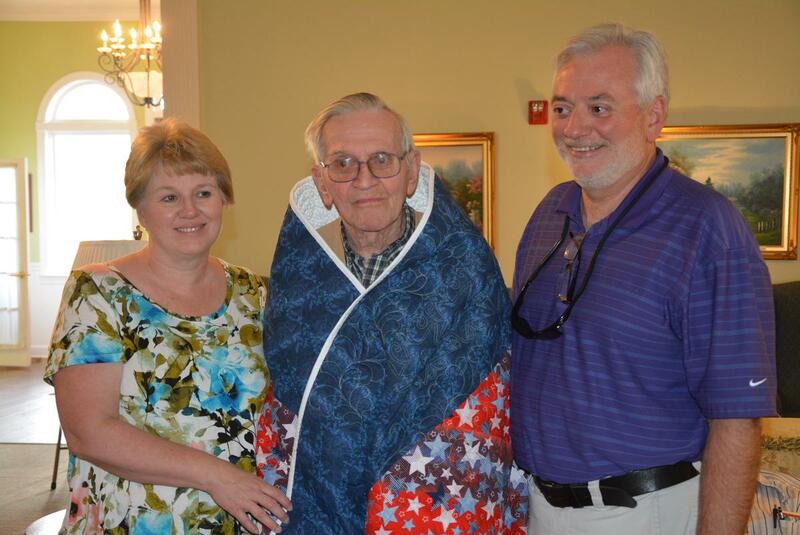 To see him cloaked in a quilt that honored his years of service was very humbling. Before today I had never even heard of Quilts of Valor, but I came away with such an appreciation for what this foundation does to honor our veterans, and I want to share this foundation with our community. Before the ceremony began, I spoke with Amy Martin, a representative of our local chapter of Quilts of Valor. She told me about the history of the Quilts of Valor Foundation. In the early 2000’s, the founder–Catherine Roberts–had a dream about her son, who was deployed in Iraq. She dreamt that he “was sitting on the side of his bed in the middle of the night, hunched over.” Catherine described the feeling of the dream as “one of utter despair.” She said she could see the demons of war surrounding him and “dragging him down into an emotional gutter” (www.qovf.org). What happened next in her dream sparked her idea for Quilts of Valor. She saw the soldier wrapped in a quilt, safe and sound. So, she set out to show her appreciation for our veterans by offering them special, hand-made quilts. As we continued talking, Amy Martin, went on to tell my family and me that her goal is to present quilts to every WWII Veteran in Bedford County. She spoke with such passion and called her work for this foundation a ministry. If you know or are related to a WWII veteran in Bedford County that has not yet received a quilt of valor, please contact Shelbyville Now with their information. We want to help Amy reach her goal. If you would like to support the Quilts of Valor Foundation, please visit their website, www.qovf.org/donate. Vote Smart: Local elections affect everyday life.